Kurt Bosshardt at Merle Wood & Associates tells me that he's now sold the 36.8m motor yacht Java with no other brokers involved. Java is an all-aluminium superyacht. Built by Broward Marine in 1990, she had a thorough refit in 2003 including a new interior by Janet Richards. 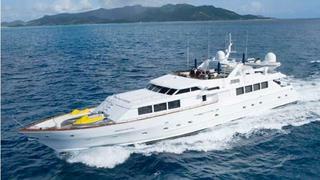 Upgraded several times in the past few years, she boasts spacious reception areas and extensive deck spaces. This superyacht accommodates 10 guests in a master, two double and two twin cabins and her twin 1450hp DDC engines give her a cruising speed of 17 knots. Java was asking $2.9 million.